Youth Swimming Lessons offered at Lake Nokomis Main Beach, Wirth Beach, Jim Lupient Water Park, North Commons Water Park, and Webber Natural Swimming Pool. Parents/guardians will be notified of swim lesson cancellations through email. 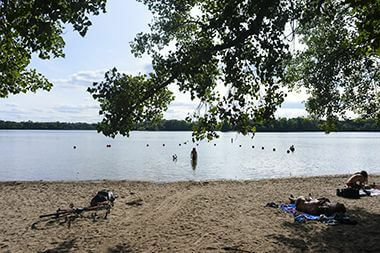 We have 12 beaches in the Minneapolis park system. View a list of all our beach locations. Do not use inflatable air mattresses, inner tubes, other inflated articles, or inflatable floatation equipment except by permit. See floatation ordinance. Alcohol consumption is only allowed in designated areas at restaurants(link) licensed to serve alcohol or for those who’ve obtained a special use permit (link). See alcohol ordinance. No threatening, abusive, indecent language, conduct or behavior allowed. See prohibited language and conduct ordinance. Do not swim across any lake or park water unless accompanied by a boat. See swimming across lake ordinance. Do not swim or bathe at any unauthorized beach or park water. See unauthorized beach ordinance. Do not swim in lakes or gather on beaches between the hours of 10 pm and 6 am. See beach hours ordinance. High bacteria levels generally occur right after it rains, and return to normal levels within 48 hours. 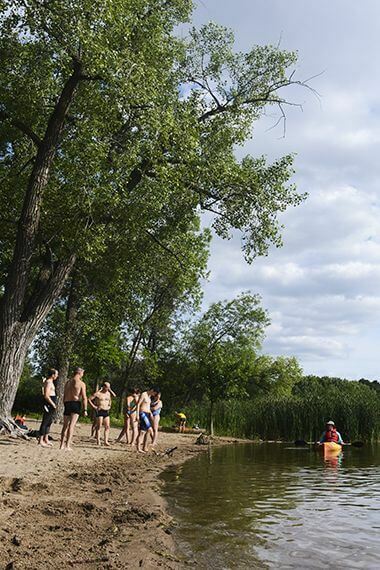 Swimmer’s itch is a temporary, harmless skin rash that occasionally affects lake users. Small, irritating red welts typically appear after swimming on hot, still summer days. Sensitive individuals may itch for several weeks. The rash is caused by a parasite that infects birds and snails. The parasite cannot live in humans. Naegleria fowleri is an amoeba found in warm freshwater and soil that can causes a very rare but often fatal brain infection. From 2005 to 2014, 31 infections resulting from swimming in contaminated water were reported in the United States. Two of those instances happened in Minnesota. Visit the Minnesota Department of Health or the Centers for Disease Control and Prevention websites for additional information. Increased bacteria levels mainly come from waterfowl and pet waste in yards, streets and parks that wash into lakes either directly or through the storm sewers after a heavy rain. What does the E. coli level mean? 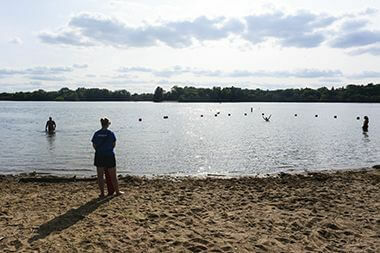 Elevated bacteria levels in MPRB lakes usually occur as a result of rain events and return to normal levels within 24 to 48 hours of the rain event. We will re-sample, and reopen the beach only when bacteria levels are within state guidelines. 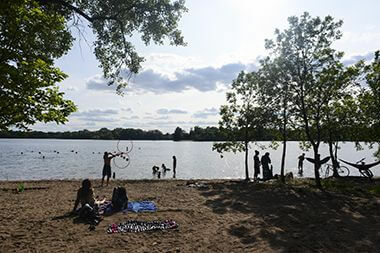 Cedar Lake East Beach is one of 3 beaches Cedar Lake has to offer, and one of twelve beaches in the Minneapolis park system.